Following the War of 1812 between the United States and Britain, American slave owners came to Florida in search of runaway African slaves and Indians. These Indians, known as the Seminole, and the runaway slaves had been trading weapons with the British throughout the early 1800s and supported Britain during the War of 1812. From 1817-1818, the United States Army invaded Spanish Florida and fought against the Seminole and their African American allies. Collectively, these battles came to be known as the First Seminole War. Undated engraving of a Seminole encampment of small huts surrounded by a circular wooden fence. Photo from the book, Encyclopedia of American Indian Wars, by Jerry Keenan. Americans reacted to these confrontations by sending Andrew Jackson to Florida with an army of about 3,000 men. Jackson was successful in his attacks and left many dead and dying Seminole behind in their destroyed villages. He went on to attack Spanish settlements and captured Spanish forts at St. Marks and Pensacola. Spaniards began to realize that they could no longer keep their territory. Spain negotiated a treaty with the United States in 1819. The agreement was signed by John Quincy Adams (Secretary of State) and Luis de Onis (Spain's Minister) and was called the Adams-Onis Treaty. The Adams-Onis Treaty gave Florida to the United States and nullified the $5,000,000 debt Spain owed to the United States. Florida now belonged to the United States. Andrew Jackson had the responsibility of setting up Florida's government, and he had a government up and running within weeks. He quickly divided Florida into two parts called counties. The area that was previously called West Florida became Escambia County, and what was once East Florida, became St. Johns County. Jackson established county courts and mayors in the cities of St. Augustine (East Florida) and Pensacola (West Florida). Afterwards, Jackson left Florida, and empowered William Pope DuVal to lead Florida as governor. Florida became an official territory on March 30, 1822. Northern settlers were invading Tallahassee, a Seminole settlement. These settlers often clashed with the Seminole. In an effort to end these conflicts, the governor asked the Seminole to move. The Seminole refused. In 1823, it became necessary for the governor to offer the Seminole a treaty, which was called the Treaty of Moultrie Creek. This treaty required the Seminole to give up their land and move south. It also made them agree to discontinue hiding runaway slaves. The Seminole were given four million acres of land in the area south of present-day Ocala. Massacre of the Motte family during the second Seminole War. Photo from the book, Encyclopedia of American Indian Wars, by Jerry Keenan. This area was called a reservation. This reservation, however, did not suit the needs of the Seminole. Meanwhile, their former home in Tallahassee, became the new capital of the territory. In 1829, Andrew Jackson became President of the United States. He worked to have the Indian Removal Act passed by Congress. It became law in 1830. The purpose of this act was to move all the Indians to land west of the Mississippi River. The Seminole did not want to leave their Florida home, but agreed to send some chiefs to look at the new land where they would be relocated. While they were viewing the land, the chiefs were persuaded to sign a treaty agreeing to move. When they returned back to Florida, however, they claimed they had been tricked. They refused to leave. American Indian Wars, by Jerry Keenan. A warrior named Osceola led the Seminole in surprise attacks against the Americans. The first battle of the war was known as the Dade Massacre. It occurred when Major Dade was leading a combined Army from Fort Brooke (Tampa) and Fort King (Ocala). In an attack by Osceola and his men, over a hundred soldiers were killed near what is now Bushnell. The United States sent many troops into Florida to defeat the Seminole. They were successful in pushing the Seminole further and further south into the wilderness. Several agreements were made by Seminole chiefs to leave the area, but the agreements continually fell through. Finally, Osceola was captured and he died in prison in 1838. Following his death, the Seminole began to decline. Many were killed; others were captured and relocated out west. On August 14, 1842, The Second Seminole War officially ended. As a result, many Seminole were sent to reservations in the west. Floridians had continued to take steps toward statehood throughout the confrontations with the Indians. In December 1838, the year Osceola died, Florida held a convention to write a constitution. The constitution contained the laws that the citizens of Florida had agreed on to rule the territory. A council voted on and approved the constitution in 1839. At that time, the United States Congress would not approve Florida as a new state because it wanted to join as a slave state. Florida was eventually admitted to the United States as a slave state at the same time that Iowa was admitted as a free state on March 3, 1845. The following is from the book, Indian Wars by Robert M. Utley and Wilcomb E. Washburn. The following information is from the book, The American Indian Wars, by John Tebbel & Keith Jennison. 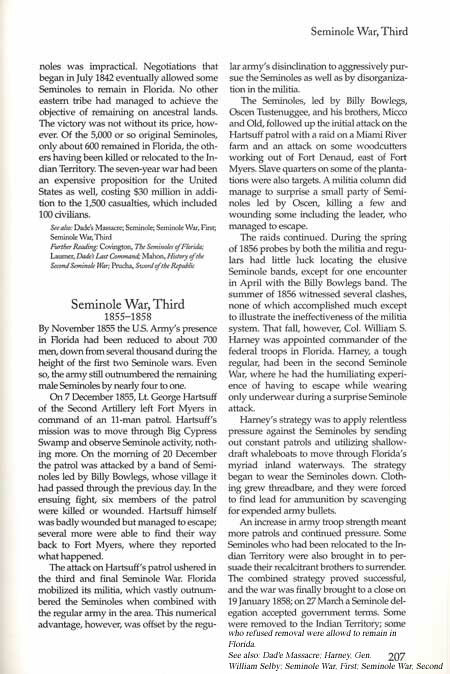 The following is a story about the Third Seminole War from the book, Encyclopedia of American Indian Wars, by Jerry Keenan.